Exmoor ponies are an English breed that has many practical uses. They are described as hardy, tough, and rather pleasant. They can be used for riding, in competitions, and also in races. They are found in Scotland, Ireland, Wales, France, and the United Kingdom (especially in the Exeter region). They are considered very sweet and agile. 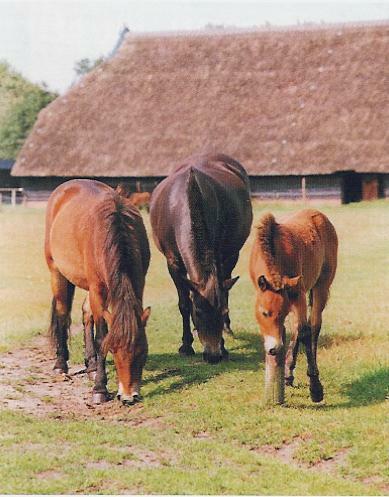 Exmoor ponies are around twelve hands tall and are bred in brown shades. They have a smaller head considering their size and also have tough ribs. They are short creatures with strong feet. Compact and sturdy for their many useful purposes, they are neat and possess a unique muzzle.